High quality hard plastic enclosure, durable and very nice looking. Super slim and lightweight, easy to carry. Plug and play, no extra driver required, just plug it into USB connector directly, it will automatically install driver by itself. Powered directly from the USB port, no external power required. USB 1.1/2.0 compatible, Read/Write 1.44 MB floppy disk. 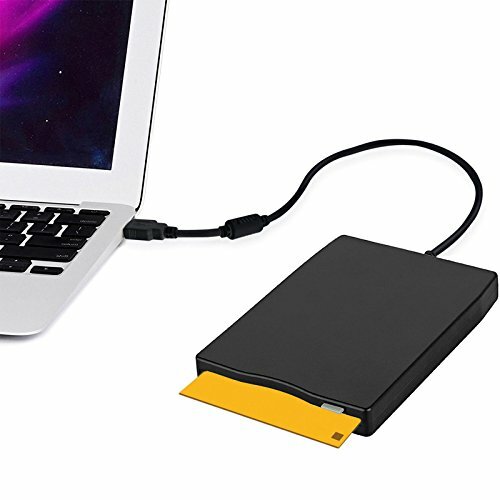 Give new life to your old floppies, ideal for Desktops and Laptops, Windows 98 / SE / 2000 / ME / XP / VISTA /Windows 7 / Windows 8 / Windows 10/ MAC etc. For running smoothly, please plug our external floppy disk drive into rear USB interface of motherboard directly. If you connect our floppy drive through USB hub, USB extension cable or frontal USB interface, it may not be recognized by your computer because it cannot get sufficient power from them.